Acne is a group of skin rashes that have different causes but present with similar lesions. It is a condition that affects humans as well as some mammals, and being the most common skin disease, it is considered by some as a part of the normal human growth process. It varies in its etiology, as well as its severity. Occasionally a direct cause may be identified, while commonly no inciting agent is ever seen. Acne is an important and sometimes overlooked state, which if left untreated could lead to a lifetime of disease sequelae, such as scarring and skin hyperpigmentation. Some forms have been associated with even more severe acute manifestations that require emergent therapy. When used generically, the term "acne" refers to acne vulgaris. Even though broadly stated under the category of acne, the various conditions stated above are separate disease entities. However, they present with similar lesions. While acne has a variety of causes, and rarely is a direct cause identified, in some cases it is clearly tied to human social responsibility, such as the cases of acne resulting from cosmetics or chlorinated hydrocarbons. Furthermore, individuals have an individual responsibility for treatment, given the potential for later scarring. On the other hand, as undesirable as acne is for the sufferer, it is almost always a temporary condition, with effects that diminish and disappear over time. The main responsibility for the sufferer may be an internal one, to maintain a healthy balance in one's life with a positive attitude where physical appearance is not overemphasized. Acne vulgaris is the most common form of acne. Acne affects a large percentage of humans at some stage in life. The condition is most common during puberty and is considered an abnormal response to normal levels of the male hormone testosterone. The response for most people diminishes over time and acne thus tends to disappear, or at least decrease, after one reaches his or her early twenties. However, there is no way to predict how long it will take for it to disappear entirely, as some individuals will continue to suffer from acne decades later into their thirties, forties, and beyond. Excessive secretion of oils from the sebaceous glands (mostly due to gland enlargement during puberty), accompanied by the plugging of the pores with naturally occurring dead skin cells (corneocytes), results in a blockade of the hair follicles. The accumulation of these corneocytes in the duct appears to be due to a failure of the normal keratinization process in the skin that usually leads to shedding of skin cells lining the pores. Once this defect in the keratinization process leads to these cells blocking the pore, the oil build up within the pore provides a favorable environment for the bacteria Propionibacterium acnes to multiply uncontrollably. In response to the bacterial populations, there is inflammation with attraction of white blood cells (neutrophils) to combat the bacteria, producing the visible lesion. The lesions have a propensity to affect the face, chest, back, shoulders, and upper arms. The lesions occur as various forms and include comedones, papules, pustules, nodules, and inflammatory cysts. Commonly, a pore that remains open (open comedo) but continues to distend with the keratinocytes, then sebum oxidized by the bacteria, as well as the skin pigment melanin, is referred to as a "blackhead." On the contrary, when a pore is occluded (closed comedo) by the dead skin cells, leading to accumulation of the materials below it, it is referred to as a "whitehead." Cysts, pustules, papules, and nodules are more extensive lesions that usually arise when the accumulations within the pore rupture into the surrounding skin. The level of the rupture determines the severity of these lesions. After resolution of acne lesions, prominent unsightly scars may remain. Hyperpigmentation of the skin around the lesion also has been noted, especially in darker skinned individuals. Aside from scarring, its main effects are psychological, such as reduced self-esteem, depression, embarrassment, and rarely suicide.One study has estimated the incidence of suicidal ideation in patients with acne as high as 7.1 percent  Acne usually appears during adolescence, when people already tend to be most socially insecure. Early and aggressive treatment is therefore advocated to lessen the overall impact to individuals. Pregnancy, disorders such as Polycystic ovary syndrome (PCOS),Cushing's syndrome, and increasing cases of menopause-associated acne as fewer women replace the natural anti-acne ovarian hormone estradiol whose production fails as women arrive at menopause. Misconceptions: There are many misconceptions about what does and does not cause the condition including diet, hygiene, and sexual activity. Various studies have been done, but the role of these factors still remains unclear and uncertain. Acne cosmetica refers to acne caused by or made worse by cosmetics. The mechanism was presumably a chemically induced plugging of the pilosebaceous orifice. This was a significant problem for dermatologists in the 1970s and 1980s, but with the improved formulations produced by cosmetic chemists over the past thirty years, this is now a relatively rare diagnosis in daily practice. The terms "non-comedogenic" appeared on moisturizers and other cosmetic compounds as re-formulations were introduced, sometimes associated with claims that the products were oil-free or water-based. Although early work produced lists of comedogenic chemicals in various strengths and vehicles, it became apparent that the actual comedogenicity of a product could not be predicted from its contents; rather the finished product itself needed to be use-tested. The production of a low-grade folliculitis by some components of the cosmetic product has led to misdiagnosis on occasion. Acne medicamentosa refers to acne that is caused or aggravated by medication. Because acne is generally a disorder of the pilosebaceous units caused by hormones, the medications that trigger acne medicamentosa most frequently are hormones. Although the male's hormone testosterone is most often blamed, and although men with acne occurring secondary to bodybuilding hormones is seen from time to time, the major hormonal medication that causes acne is the progestin/progestagen present in birth control pills. Other medications can produce 'acneiform' eruptions (usually pimply bumps and pustules that look like acne). Some conditions mimic acne medicamentosa. The most common mimic is the yeast folliculitis produced by an overgrowth of the Malassezia species, often secondary to oral or systemic corticosteroids, or secondary to broad-spectrum antibiotics such as the tetracycline family used in acne. This is often misinterpreted as "tetracycline-resistant acne." Acne neonatorum (Baby acne) refers to a condition that affects roughly 20% of newborn babies. Lesions appear at around two weeks postpartum and commonly disappear after three months. Lesions include small, red, papules, which mainly affect the cheeks, as well as the nasal bridge of infants. Infants usually develop neonatal acne because of stimulation of the baby's sebaceous glands by lingering maternal hormones after delivery. These hormones cross the placenta into the baby and after delivery they cause the oil glands on the skin to form bumps that look like pimples. Baby acne usually clears up within a few weeks, but it can linger for months. Commonly mistaken for baby acne, tiny bumps on a baby's face after birth that disappear within a few weeks are called milia and are unrelated. Chloracne is an acne-like eruption of blackheads, cysts, and pustules associated with over-exposure to certain halogenic aromatic hydrocarbons, such as chlorinated dioxins and dibenzofurans. The lesions are most frequently found on the cheeks, behind the ears, in the armpits and groin region. The condition was first described in German industrial workers in 1897 by Von Bettman, and was initially believed to be caused by exposure to toxic chlorine (hence the name "chloracne"). It was only in the mid-1950s that chloracne was associated with aromatic hydrocarbons. The substances that may cause chloracne are now collectively known as "chloracnegens." 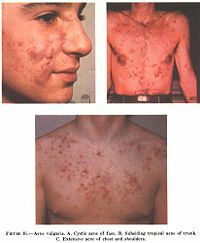 In some instances, chloracne may not appear for three to four weeks after toxic exposure; however in other cases, particularly in events of massive exposure, the symptoms may appear within days.. Once chloracne has been identified, the primary action is to remove the patient and all other individuals from the source of contamination. Further treatment is symptomatic. Severe or persistent lesions may be treated with oral antibiotics or isotretinoin. However, chloracne may be highly resistant to any treatment. Acne fulminans (acne maligna) is a rare and severe form of acne involving a sudden onset of bleeding and ulcerative acne lesions spreading over the face, back, and chest. It may be part of SAPHO syndrome, which comprises of synovitis, acne, pustulosis, hyperostosis, and osteitis. It is a severe condition treated with wound care, corticosteriods, nonsteroidal anti-inflammatory drugs, isotretinoin, and infliximab..
Acne conglobata refers to a chronic form of inflammatory acne marked by communicating blackheads, communicating cysts, abscesses, papules, pustules, and draining sinus tracts. Due to its chronic and highly inflammatory course, it usually ends with keloidal and atrophic scarring. It is part of a larger follicular occlusion syndrome consisting of acne conglobata, hidradenitis suppurativa, and dissecting cellulitis of the scalp. Acne rosacea is a chronic cutaneous condition affecting the chin, cheeks, nose, and forehead. It is characterized by the presence of flushing, erythema, telangiectasia (spider veins), rhinophyma (of the nose), swelling, papules, pustules, and may even involve the eye. It is currently treated with tetracyclines, topical antibiotics such as metronidazole, as well as other measures to provide symptomatic treatments. Ancient Rome : bathing in hot, and often sulfurous, mineral water was one of the few available acne treatments. One of the earliest texts to mention skin problems is De Medicina by the Roman writer Celsus. 1800s: Nineteenth century dermatologists used sulphur in the treatment of acne. It was believed to dry the skin. 1950s: When antibiotics became available, it was discovered that they had beneficial effects on acne. They were taken orally to begin with. Much of the benefit was not from killing bacteria but from the anti-inflammatory effects of tetracycline and its relatives. 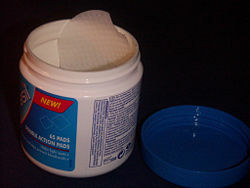 Topical antibiotics became available later. 1960s: Tretinoin (original Trade Name Retin A) was found effective for acne. This preceeded the development of oral isotretinoin (sold as Accutane and Roaccutane) since the early 1980s. Some old treatments, like laxatives, have fallen into disuse but others, like spas, are recovering their popularity. There are many products sold for the treatment of acne, many of them without any scientifically-proven effects. Generally speaking, successful treatments manifest usually after eight weeks, the time it takes for a comedone to mature completely. Other treatments may offer quick, temporary relief as they reduce inflammation. This type is mild in nature and is characterized by the presence of comedones without much surrounding inflammation. The treatment of this entity focuses on the correction of the abnormal follicular keratinization process. Drugs such as topical retinoids (i.e., tretinoin, adapalene, tazorotene), are preferred and available only by prescription. Many over the counter preparations containing salicylic acid, benxoyl peroxide, or glycolic acid have also been found to have some use as they exhibit antimicrobial and comedolytic properties. They are especially useful when the side effects of the retinoids (excessive dry skin) can not be tolerated.. Mechanical methods to open the pores are also used as an adjunct to the topical medications. As comedonal acne progresses with the appearance of increasing inflammatory lesions, combination therapy has proved to be very efficacious. 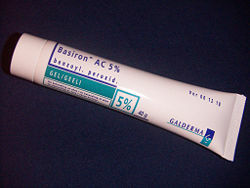 A topical antibiotic (i.e. erythromycin, clindamycin, metronidazole) along with a topical retinoid, are being used together with greater success than either agent alone. Benzoyl peroxide or adapalene are also being used in combinations with the topical antibiotics and topical retinoids with greater success than either agent alone..
As lesions progress to involve larger areas on the face as well as other body parts such as the back and trunk, topical therapies combining benzoyl peroxide, topical antibiotics, and topical retinoids are used to provide relief. Patients not responding to this therapy are requested to add an oral antibiotic (ie. tetracycline, doxycycline, trimethoprim-sulfamethoxazole, etc.) or isotretinoin. It is important to note that isotretinoin carries potentially severe side effects that require strict monitoring and stringent guidelines before it is prescribed. Women that have been found to have hormonal abnormalities may also benefit from estrogen or antiandrogenic hormonal therapy. Of these various modalities that have been approved for the treatment of acne, phototherapy with high intensity narrow-band blue light (405 to 420nm) is the only therapy that has been proven to be efficacious in the treatment of acne.. The equipment or treatment, however, is relatively new and reasonably expensive, and therefore not generally recommended or used for this purpose. Zinc - Orally administered zinc gluconate has been shown to be effective in the treatment of inflammatory acne. Niacinamide (Vitamin B3) is used topically in the form of a gel. The property of topical niacinamide's benefit in treating acne seems to be its anti-inflammatory nature. In some cases, people found bathing in salt water noticed lessened redness and decreased size in their acne. There are also certain treatments for acne mentioned in Ayurveda using herbs such as Aloevera, Aruna, Haldi, and Papaya. Because acne appears to have a significant hereditary link, there is some expectation that cheap whole-genome DNA sequencing may help isolate the body mechanisms involved in acne more precisely, possibly leading to a more satisfactory treatment. However, DNA sequencing is not yet cheap, and all this may still be decades off. It is also possible that gene therapy could be used to alter the skin's DNA. Phage therapy has been proposed to kill Propionibacterium acnes and has seen some use. Severe acne often leaves small scars where the skin gets a "volcanic" shape. Acne scars are difficult and expensive to treat, and it is unusual for the scars to be successfully removed completely. Acne scars generally fall into two categories: physical scars and pigmented scars. Physical acne scars are often referred to as "icepick" scars. This is because the scars tend to cause an indentation in the skins surface. Pigmented scars are usually the result of nodular or cystic acne. They often leave behind an inflamed red mark. Often, the pigmentation scars can be avoided simply by avoiding aggravation of the nodule or cyst. When sufferers try to "pop" cysts or nodules, pigmentation scarring becomes significantly worse, and may even bruise the affected area. The treatment for severe scarring include punch excision, punch elevation, subcutaneous incision, scar excision, and laser skin resurfacing. ↑ G. Goodman, "Acne and acne scarring: the case for active and early intervention," Aust Fam Physician 35(7) (2006): 503-504. PMID 16820822. Retrieved December 19, 2007. ↑ D. Purvis, E. Robinson, S. Merry, and P. Watson, "Acne, anxiety, depression and rarely suicide in teenagers: a cross-sectional survey of New Zealand secondary school students," J Paediatr Child Health 42(12) (2006): 793-796. PMID 17096715. ↑ A. Picardi, E. Mazzotti, and P. Pasquini, "Prevalence and correlates of suicidal ideation among patients with skin disease," J Am Acad Dermatol 54(3) (2006): 420-426. PMID 16488292. ↑ B. De Marchia, and J. R. Ravetzb, "Risk management and governance: a post-normal science approach," Futures 31(1999): 743–757. ↑ M. Iqbal, and M. Kolodney, "Acne fulminans with synovitis-acne-pustulosis-hyperostosis-osteitis (SAPHO) syndrome treated with infliximab," Journal of the American Academy of Dermatology 52(Suppl 1, 2005): 5. ↑ A. Yan, "Current concepts in acne management," Adolescent Medicine Clinics 17(2006): 3. ↑ J. Wilkin, M. Dahl, M. Detmar, L. Drake, A. Feinstein, R. Odom, and F. Powell, "Standard classification of rosacea: Report of the National Rosacea Society Expert Committee on the Classification and Staging of Rosacea," Journal of the American Academy of Dermatology 46(2002): 4. ↑ E. J. van Zuuren, A. Gupta, M. Gover, M. Graber, and S. Hollis, "Systematic review of rosacea treatments," Journal of the American Academy of Dermatology 56 (2007): 1. ↑ J. J. Leyden, "Therapy for acne vulgaris," New England Journal of Medicine 336(1997): 1156. ↑ J. S. Weiss, "Current options for the topical treatment of acne vulgaris," Pediatric Dermatology 14(1997): 480. ↑ W. F. Bergfeld, and R. B. Odom, "New perspectives on acne," Clinician 12(1996): 4. ↑ S. Hurwitz, "Acne vulgaris: pathogenesis and management," Pediatric Review 15(1994): 47. ↑ D. P. Lookingbill, D.K. Chalker, J. S. Lindholm, "Treatment of acne with a combination clindamycin/benzoyl peroxide gel and vehicle gel: Combined results of two double-blind investigations," Journal of the American Academy of Dermatology 37(1997): 590. ↑ J. Leyden, D. M. Thiboutot, A. R. Shalita, et al., "Comparison of tazarotene and minocycline maintanence therapies in acne vulgaris: a multicenter, double blind, randomized, parallel-group study," Archives Dermatology 142(2006): 605. ↑ A. Kawada, Y. Aragane, H. Kameyama, et. al., "Acne phototherapy with high intensity, enhanced, narrow band, blue light source: an open study and in vitro investigation," Journal of Dermatological Science 30(2002): 129. ↑ B. Dreno, P. Amblard, P. Agache, S. Sirot, and P. Litoux, "Low doses of zinc gluconate for inflammatory acne," Acta Derm Venereol 69(6, 1989): 541-543. PMID 2575335. ↑ B. Dreno, D. Moyse, M. Alirezai, P. Amblard, N. Auffret, C. Beylot , I. Bodokh, M. Chivot, F. Daniel, P. Humbert, J. Meynadier, and F. Poli, "Multicenter randomized comparative double-blind controlled clinical trial of the safety and efficacy of zinc gluconate versus minocycline hydrochloride in the treatment of inflammatory acne vulgaris," Dermatology 203(2, 2001): 135-140. PMID 11586012. ↑ K. J. Koh, A. L. Pearce, G. Marshman, J. J. Finlay-Jones, and P. H. Hart, "Tea tree oil reduces histamine-induced skin inflammation," Dermatology (2002): 147. ISSN 0007-0963. ↑ M. D. Farrar, K. M. Howson, R. A. Bojar, D. West, J. C. Towler, J. Parry, K. Pelton, and K. T. Holland, "Genome sequence and analysis of a Propionibacterium acnes bacteriophage," J Bacteriol 189(11, 2007): 4161-4167. PMID 17400737. Habif, T. P. 2004. Clinical Dermatology: A Color Guide to Diagnosis and Therapy. Edinburgh: Mosby. ISBN 0323013198. James, W. 2005. Clinical practice. Acne. N Engl J Med 352(14): 1463-1472. PMID 15814882. Webster, G. F. 2002. Acne vulgaris. BMJ 325(7362): 475-479. PMID 12202330. Retrieved December 19, 2007. Wirth, F. A. 2007. Approach to acne vulgaris. UpToDate.com. Retrieved December 17, 2007.